For some of us, photojournalists working on daily assignments for newspapers, Fine Art photographs are kinda way off our Panorama. To be honest, some of my colleagues usually don’t pay too much attention to this “kind” of photography. They consider it something from another galaxy. But I`ve been giving myself a chance to explore this field, not as a photographer but more like an observer for more than 2 years now. There is a common belief that Fine Art photographers are sort of like grumpy artists that don’t care about the work of photojournalists whether they are working in a local or in a well known newspaper. Much less independent photographers, of course. But Photographer Mark Power is quite the opposite of that! Mark Power, born in Harpenden, UK, is a Magnum Photographer who studied at Loughborough College of Art and later at Brighton Polytechnic. BA Hons Visual Communication (1st Class) (1978-1981). He is a writer, photographer and professor of Photography at Brighton University. At this point, I don’t remember whether I found out about the work of Mark Power because of his essays, photographs or books but I can truly say that not only I enjoy his work, and I try to learn something about it, but also I think he breaks the paradigm of grumpy artist that most people have taken for granted. In my opinion, Mark Power is an open-minded photographer who believes in and embraces all sources of photography as an equal force. He is not that kind of photographer who discriminates in any sense the effort and quality of his colleagues whether they are the newest aspiring photographers or the most experienced one. This kind of respectful perspective not only led him to be one of the best in his field, but also he was invited to participate in a Magnum Photos group project last year entitled Georgian Spring. Georgian Spring in a few words is the journal of ten Magnum photographer offering a multi perspective view of the modern and contemporary Georgia. Every Photographer invited to this project was assigned a theme to be developed during their stay in the country. The theme “Industry and the Economic” was assigned to Mister Power. “I didn’t go to witness the effects of the war. However, my theme, “Industry and the Economic”, covers most bases”. Mark Power. Mister Power kindly agreed to give us (Me and the readers of Photojournalism: A love Story) an exclusive interview where he tells us about his experience in this project and give us a behind the scenes look of his work in Georgian Spring. I first heard about it, or rather the possibility of it, at the Magnum Board meeting in New York in December 2008. Thomas Dworzak was there, and mentioned there was the possibility of a Magnum group project in Georgia. Thomas is very well connected, and liked, in Georgia, and it was his idea from the outset. Now, having seen Thomas operate there, I realise he is more Georgian than the Georgians. Chris Boot called me at home in February, offering one of the places on the project, and discussed with me my theme... i was disappointed at first that I was being asked to cover 'Industry and the Economy', because I always get typecast into looking at these subjects, or something similar, but when I heard more about the doors that would open for me, and the fact that 'the journey', and what I saw along the way, was equally important to the factories, then I happily agreed. And, if you think about it, 'the economy' includes just about everything anyway. I arrived at the end of March, I think it was, and stayed for 15 days. I did a little research, yes, but I do prefer to be surprised by what I find in new places. And because everyday was organised to the nth degree, there was no point in me making an itinerary for myself. In a way, people always expected a certain kind of photos of every photographer involved in this project. Perhaps because everyone has a unique style or a well known form to photograph their subjects, either its technical or in others terms. In your case, Being a photographer with a published book as Superstructure and works like sound of two songs (2004-2009) and the Corporate choices (2002- 2007), people were amazed with the photographs of a golden International Airport Railway Terminal, a business centre in Tbilisi and the Abkhazian Refugee Camp, but they didn’t expect to view a powerful and maybe a warm photograph like the Georgian dancer standing alone in what it seems to be a dance school when they first heard your chosen theme. 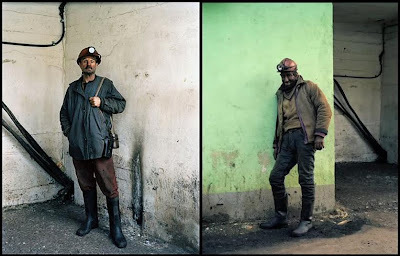 The portraits of the coal miners are another example of this “unexpected, surprising and delightful” feeling that many people felt when they first saw the pictures. You have been taking portraits in your previous assignments, that is not new to you or your work, but why do you think photographs like the little boy at the dance school (alone or with the rest of the dancers) causes such effects on people to the point that your work in this projects is considered as one of the highlights of the book? Well, that's kind, but I don't really see the portraits as anything very different. I still think they look like 'my work' and that the whole set in the book - and many more in the exhibition, which is a slideshow - hangs together pretty well, always hard to do when you only spend a couple of weeks on a project. How advantageous is it to work with a guide? In your case, Dima Bit- Suleiman. And can you tell how your relationship with the guide was? Did you follow a specific work schedule? Dima was fantastic... he understood very quickly the way that I worked, and so let me stay longer in certain places when necessary. He was given a very full and tight schedule for me to cover, and, while we did do most of it, some appointments did fall by the wayside. I couldn't have done it without him. I also took my own assistant - Murray Ballard ( www.murrayballard.com ) - a fine photographer himself. The budget didn't cover Murray's fee (so I paid him myself, and he kindly accepted less than he'd normally ask for, because he wanted to have the experience). I think the three of us worked very well together - we were a good team. It really was a team effort. How much time did you spend selecting the photos that are in the book? And what was your criterion? Chris Boot and I did it together. We were in a reasonable agreement about it. Mister Power, being a Professor of Photography at Brighton University, could you tell us what do you think about those people saying that to become a photographer it’s not necessary to apply for a formal education? There are certain things that a “wannabe” photographer can learn on his/her own, but there are others that might seem a bit more complicated to learn or generate on his/her own path, as guidance, confidence, and tutorship. Does it matter at all? What is the advantageous of School? Well, I'd say that if someone wanted to operate in the world that I do, it's important for them to be able to talk well and convincingly about their work, to understand what they are doing, and the historical (and sometimes theoretical) context it sits in. Good colleges help you do that. But it has to be said that real learning happens outside of college... although we try to prepare students for the outside world it's really impossible to do it well. And most ex-students - graduates - realise that the real hard work begins after they leave. In short, I'd say it suits some people, and not others. 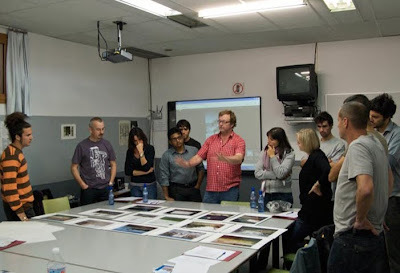 Students at Magnum Workshop Barcelona with Mark Power / Photos courtesy of this blog. And Finally, I`ve noticed that today`s photojournalism, just to name an example, in most cases Is about how fast is the camera and how many photos (usually hundreds) a photographer takes in an assignment. What do you think it’s the biggest weakness in the digital era? I think it's the lack of a 'relationship' with your subject at the moment of taking the pictures that worries me. I'm not talking about hard-nosed photojournalists here, for whom speed is of the essence - digital technology is perfect for them. But others who work - like i do - in 'quieter' situations should really be thinking about what they are looking at when they press the button... not afterwards, when staring at a screen trying to decide which is the best picture of a chair (for example) from a thousand similar possibilities. There is really something to be said for the discipline of working with a large format, 5x4 inch plate camera, as I use. Every time I press the shutter it costs me ten pounds. Don't get me wrong - I don't enjoy the expense, but it really does concentrate the mind. I do all my editing, pretty much, while I'm photographing, because I simply can't afford to take many pictures. In Georgia I took 180 single sheets and went over my allotted budget by doing so. It was a lot of pictures for me in just two weeks. 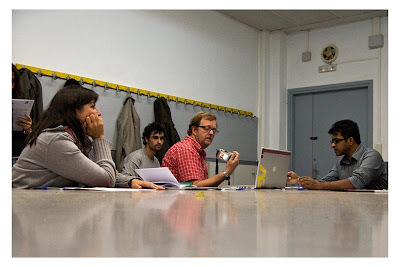 Magnum Workshop Barcelona with Mark Power / Photos courtesy of this blog. And for all of you friends, here´s an interview of Mark Power by the people of HPGraphicArts. Well, What do you think? I hope you have learned a thing or two! i know i did! Thank you Mister Power for your time! and Thank you Friends! See you on the road! Hey what's the deal here? where are the updates? I have to pay to get access to some VIP area or what? Hi my dear friend...lately, i`ve been working on the design of my upcoming website. And as you know, it`s quite a big task to get all my portfolio organized in a way that makes sense to everybody. due to all the variety of the photos i`ve been taking as a Press photographer, revisiting my archives has been a long process for me - long but surprising at the same time. All i have to say is that it is working out so far...i`ll be posting some new material on my blog as soon as i get this thing done. Its never too late to see The Great Performers. Welcome to Photojournalism: A love story. Photojournalist based in Kuala Lumpur, Malaysia.